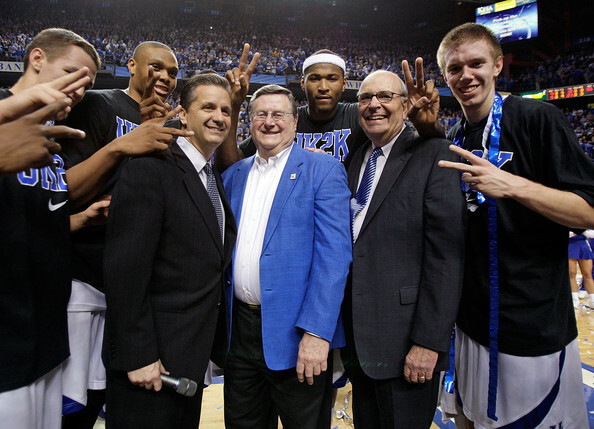 John Calipari (left in suit) the Head Coach of the Kentucky Wildcats is pictured with Joe Hall ( middle) and Herky Rupp (right) after the 88-44 victory over the Drexel Dragons at Rupp Arena on December 21, 2009 in Lexington, Kentucky. The victory was the 2,000th for Kentucky . Joe Hall coached Kentucky to a national championship and Herky Rupp is the son of former Coach Adolph Rupp.